Two lengthy reports on the FEG were published in the Journal of Scientific Exploration last year by Prof. Stephen Braude and Dr Michael Nahm, and Prof. Braude gave a talk on his research to the SPR back in October 2014 on the occasion of his being awarded the Myers Memorial Medal. 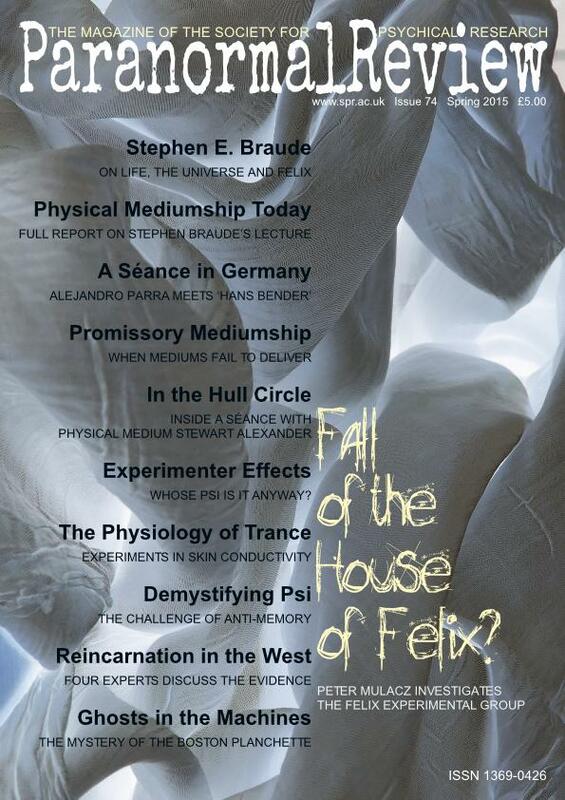 For this issue Prof. Braude gave an interview, discussing his investigation in particular, and Marian Barton reports on his October lecture. It is a rare chance to bring so many of the principal researchers in a case together and is something of a scoop for the Paranormal Review. Taken together, these different viewpoints provide a unique insight into the FEG and the development, not only of the alleged phenomena, but also of the investigations into it. Readers wishing to explore the controversy further may be interested in the article and photographs posted by Hermann Haushahn, recently taken down but still preserved at http://web.archive.org/#web/20141209133740/http://last-exit-felixcircle..... The FEG's own website is at http://felixcircle.blogspot.de/. Connelly originally presented his findings at last year’s SPR conference and, ahead of this year’s SPR conference in July, I am pleased to be able to publish another article based on a paper presented at the 2014 conference: Dr Sean O’Donnell on anti-memory. He first broached the subject in the Paranormal Review ten years ago and it is still just as challenging now as it was then. Callum Cooper reports on the SPR Study Day on reincarnation in the West, giving a useful précis of current thinking on the topic. As usual, Brandon Hodge wraps up the issue with a enthralling tale of the collector’s ‘game of firsts’. I only wish that I had more room to print all of the wonderful illustrations that he sends me. This issue is the fourth that I have published as editor and so marks a full year of the Paranormal Review. I remember the panic I once felt at the sight of those first empty pages; only to be replaced now with a growing waiting list of people wanting to be published in these pages. As I turn ‘one’, I am sure that you will also wish to join me in congratulating Prof. Braude as he turns seventy this month. We are far from seeing the end of the FEG. Prof. Braude is already planning to continue his investigation towards the end of this year. But as will be seen from the articles published here, there are now serious reservations concerning the genuineness of the phenomena reported. Nevertheless, this is the most important case of our time. It will be interesting to see how this one plays out. Marian Barton gives us in-depth coverage of Prof. Stephen Braude's recent Gwen Tate Memorial Lecture on the Felix Experimental Group. Dr Michael Nahm comments on medium Kai Mügge's methods. 16. Fall of the House of Felix? Is there a measureable difference between supposedly real and pseudo trance states? Chris Connelly details his experiments with Spiritualist trance mediums. Callum Cooper tells us what the experts had to say on the subject of 'Reincarnation in the Western World' at the SPR's 68th Study Day.